An audience of 450m has been left in no doubt as to the proud home of rugby, writes Hugh Robertson, CEO and founding partner, RPM. With the game and its founding principles thrust straight into the worldwide spotlight, the tournament’s official opening ceremony told the story of William Webb Ellis and the birth of the game at Rugby School, with cameos from Jonny Wilkinson and Prince Harry echoing scenes from the 2012 Olympic opening ceremony. Last week we weren’t sure, but the Rugby World Cup has now literally and figuratively kicked off with a bang. We’ve already witnessed the best start that the organisers could have hoped for. One of the greatest shocks in the history of the tournament - and sport in general - with the 2019 hosts Japan stating their intentions on rugby’s biggest stage and humbly beating tournament heavyweights South Africa 34 - 32. At the end of the game South Africa players slumped to the ground in sheer disbelief at the final whistle while social media went into meltdown with a #StrongerThanTheBoks hashtag leading the memes and over 330,000 tweets during the game (peaking at 16K tweets per minute as the whistle went). The predominantly positive and congratulatory sentiments were a reminder of what a wonderfully unifying force social media can be. To provide some context, this was only the fifth World Cup game the Springboks have ever lost and Japan's second ever World Cup win. But it will be the manner in which they won that will stick in people's memory. The pride and honest determination, turning down an easy penalty for the draw in order to go for the try and win the game. A team effort, on and off the pitch, the meaning of which was written in the tears of joy that came from Japan’s shell-shocked supporters and players. In the shedding of tears the Japanese are not alone. I have already been moved to tears of joy and had several genuine belly laughs during this tournament. To the World vs England. The collective feeling that transcends geographical borders and historical indifference, is that I’m sure the competing countries would like to see us lose – especially on home soil. Paddy Power has already capitalised on the staunch rugger rivalry between England and Wales, ahead of Saturday’s big match. Erecting a huge wall where people can leave their signature and a message, presumably, of abuse for England (to be delivered to Twickenham on a chariot). All in good spirit of course. What’s exciting about Rugby and the World Cup is the potential for World Rugby to learn from the mistakes of its older, more commercial, more scandalous rivals. The opportunity to grow a global event and sport that maintains its values throughout, which thus far is what the tournament, its fans and brands have embodied. Social media stats depict the commercialism, dominance, and culture of celebrity vs the team in football and the disparity in comparison to rugby. Footballer Cristiano Ronaldo; the world’s most ‘social’ athlete, boasts 142 million followers across Twitter and Facebook; by comparison, Rugby’s most social player New Zealand’s Dan Carter has just under 1 million followers while six of the top 10 highest paid rugby players have no official Facebook page at all. The stars are different, the fans are different and the brands need to act differently in order to impress. Even unofficial tournament sponsors are toeing the line, knowing that traditional ambush marketing with no meaningful or relevant link to the sport will not resonate or succeed. 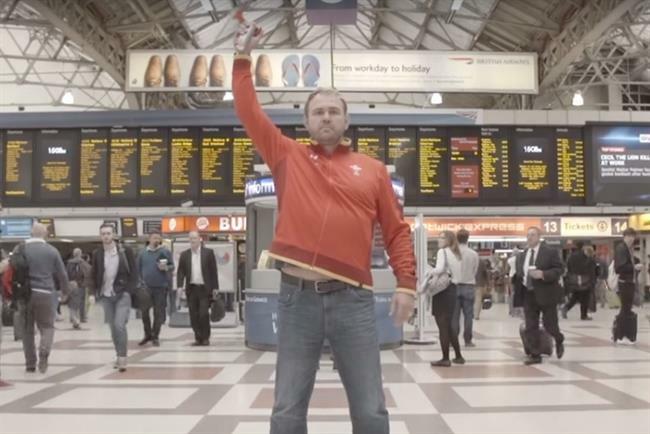 Led by Welsh rugby legend Scott Quinell, the Welsh shirt sponsor Admiral upped the ante on English soil ahead of Saturday’s big game on #TheWelshAreComing - a cheeky, patriotic flash mob choir in the heart of London. Ambush marketing has never sounded so good. To summarise, Prince Harry accurately reflected the nations' feelings around the Rugby World Cup in his opening speech: "I can think of no other sport where the success of the team is shouldered so equally by everyone both on and off the pitch."